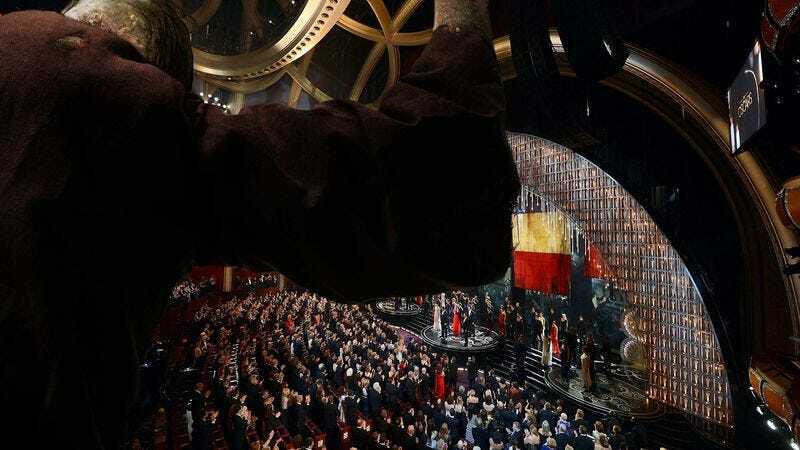 LOS ANGELES—Perched forlornly in the rafters above the merriment of the 87th Annual Academy Awards, the Dolby Theatre Hunchback stared down in longing at the beautiful guests sitting in the hall below, sources confirmed Sunday. “Oh, to have a face so fair as to be among those happy people, instead of this horrible visage that condemns me to the shadows,” said the Hunchback as he reportedly swung from the theatre’s weighted ropes to raise the curtain on John Legend and Common’s performance of the Oscar-nominated song “Glory,” lamenting that but a glimpse of his grotesque form would sicken the actors and actresses he so adored. “Alas, it is only here, hidden amongst the darkness and the dust, that one so hideous as I may dwell. But soft! My beloved Jessica Chastain speaks!” At press time, the Hunchback had cradled to his chest a crudely formed Oscar made from trash discarded at last year’s ceremony.